For 18 years the San Francisco Veg Society has been organizing the World Veg Festival to educate and inspire more people about the benefits of plant-based lifestyle for healthy, ethic, and sustainable living.. The first World Veg Festival in San Francisco happened in 1988 and has run annually ever since. It was initially launched to celebrate World Vegetarian Day, observed worldwide on October 1st. WVF brings together vegetarians and vegans, as well as curious non-vegetarians and flexitarians, to celebrate World Veg Day, featuring plant-based nutrition experts, dynamic speakers, cooking demos, great veg products that the whole family can enjoy. Every year we curate a group of the best speakers, chefs and presenters on the topics of vegan health, ethics, animal rights, good eating and more to present to our festival goers. Cam F Awesome has been a proud vegan since 2012. Cam is the #1 heavyweight boxer in the country and has won numerous national championships and Olympic Trials. Cam is a standup comic and a motivational speaker. Cam is the host of the podcast “Awesome Talks”. His goal is to break the stigma of what people think of when they hear ‘vegan’. He prides himself on breaking the vegan stereotype and called himself a NOOT (Not One Of Those). Chef Babette is a world-class chef, fitness expert and motivational speaker. She runs a successful restaurant, Stuff I Eat, and has a loyal fan base via social media outlets while participating in health summit events around the country. Chef Babette recently guest starred in the new HBO hit comedy series Insecure and the Hallmark Channel’s Home & Family amongst a few. Chef Babette shares an array of raw and cooked recipes including Inspirational Messages and Chef B’s Delectable Delights. Personal Chef, Caterer, Instructor, Restaurant Consultant and Professional Vegucator, Lisa Books-Williams has been sharing the joys of plant-based foods since 2005. Lisa has lost more than 100lbs and regained her health and vitality through WFPB eating. She won Vegan Iron Chef in 2013, is an award winning raw foods chef and a certified Green Chef Instructor. Lisa developed the culinary portion of the Plant-Based Diet Program for Kaiser Permanente and teaches patients, staff and physicians at dozens of Kaisers throughout Northern California. Patti Breitman is a co-founder of Dharma Voices for Animals and director of The Marin Vegetarian Education Group. She is the co-author of many books including Even Vegans Die (with a foreword by Dr. Michael Greger). In 2016 she was honored to receive the Lisa Shapiro Award for Unsung Vegan Heroes. Patti lives in Fairfax, CA where her neighbors and friends include coyotes, foxes, rabbits, spiders, birds, snakes, deer, and countless other beautiful creatures. Grey is one of the hottest emerging artists at the intersection between activism, urban style & hip hop. Grey became one of the most talked about acts of 2016 after his Vegan Thanksgiving freestyle & music video took the internet by storm. His superb, cerebral and soulful flow ensured that his message went global, earning nods from Russel Simmons, DL Hughley, Ellie Goulding, Unilad, Worldstar, and Baller Alert. Notching a total of 30+ million views, he was catapulted from local stardom to the global stage. Dr. Joanne Kong has been praised as one of the most compelling advocates for plant-based nutrition today. Author of If You’ve Ever Loved an Animal, Go Vegan and highly praised for her TEDx talk on veganism, she has given numerous presentations at festivals and universities around the globe. She is a volunteer with the Humane Party, has been featured on the radio showVegan Nation, and promoted veganism during a 3-week tour of India. Chef Patricia is a certified Nutrition Consultant. She and her husband Dave Koot host a weekly vegan, delicious dinner on Wed nights followed by a lively presentation at the SF Opera Plaza. Combine equal parts imagination and training. Add a heaping dash of talent and an overflowing cup of passion. Top it off with the ability to create engaging sensory experiences with the fusion of food, entertainment and fun…and you have the recipe for Jillian Love…Talented raw vegan chef, international raw educator, community organizer and event planner, inspiring presenter, extensive background and training in assisting people in personal transformation and change. Certified Raw Chef, M. Ed. Counseling, Certified Life Coach & NLP Practitioner. Mary McGovern studied translation science and lexicography at The University of Copenhagen and published two academic papers: On Translating Martinus (2010). She is a translator and teacher at The Martinus Institute, Copenhagen and has lectured on Martinus Cosmology in Denmark, Sweden, USA and UK. She graduated in music from The Guildhall School of Music and Drama, London in 1976 and subsequently trained as a teacher of the Alexander Technique. She translated The Ideal Food by Martinus into English. A recognized expert and thought leader on all aspects of living vegan, Colleen Patrick-Goudreau is an award-winning author of seven books. She is an acclaimed speaker and a multimedia host, beloved for her entertaining and informative videos and her inspiring podcast, “Food for Thought,” which was voted Favorite Podcast by VegNews magazine readers. Colleen is a regular contributor to National Public Radio. Colleen has appeared on national and regional TV programs, including the Food Network, CBS, PBS, and FOX. Interviews with her have been featured on NPR, U.S. News and World Report, The Chicago Tribune, The Miami Times, Pacifica Radio, Rodale News, and in countless blogs and podcasts. Her recipes have been featured on Oprah.com and Epicurious.com. She has a Masters Degree from San Francisco State University where she taught Psychology and Culture & Cuisine. Shanta has written and published two cookbooks, “The Ethnic Vegetarian Kitchen” and “Flavors of India” (Book Publishing Company); the later in 7th printing has become a classic among vegetarians. Shanta lives in San Francisco where she is the co-owner of Other Avenues Food Store, a worker cooperative. Shanta writes on plant-based nutrition and recipes for magazines such as India Currents and teaches vegetarian cooking. Dr. Julie Sinistore has been vegan for 18 years. In her current position as a Life Cycle Assessment (LCA) project director and consultant with WSP, she analyzes the environmental burdens and benefits from the life cycle of goods and services like agricultural products, but also electronics and construction products. Julie also teaches courses on Life Cycle Thinking and Sustainable Product Design in the mechanical engineering department at UC-Berkeley. Julie was featured on episode 411 of the Our Hen House podcast and gives lectures on the environmental impacts of food choices around the bay area. Alex Tiphayachan is a certified life coach motivational speaker ,vegan traveler and YouTuber. I will be hosting a table on diversity and veganism and the importance of seeing our differences as a strength. 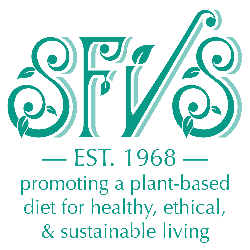 The San Francisco Veg Society (SFVS) is a non-profit, volunteer-run organization founded in 1968. We promote the adoption of a plant-based diet and lifestyle for healthy, ethical and sustainable living. Based in historically progressive city of San Francisco, we offer a community for people to meet, learn, exchange ideas and information, and interact with others interested in plant-based living for a better world. Together we can make this movement grow and encourage a lifestyle that is better for your health, better for the well-being of animals, better for the environment and better for humanity.